At times, we are all involved in high stakes negotiations — there is a lot of money on the line and we don’t get more than a few shots. Many times the temptation is to go to war and strive to maximize our value since it might have a large impact on the bottom line, but too often this results in the failure of both the negotiation as well as the relationship delivering not just zero value, but a long term cost. 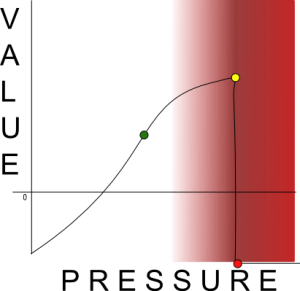 The green dot represents the philosophy of leaving some money on the table. 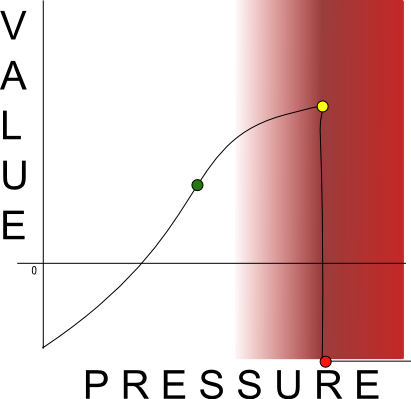 Negotiate for as much as we can, once we are above zero value for ourselves but may not have maxed out the value, we decide to deliver more perceived value than we cost. This is win-win and in my experience, does the most for increasing overall value to a business. The yellow dot represents our goal when we start feeling the heat of battle. The goal of “cliff negotiators” or win-lose negotiations (though rarely will someone be brave enough to admit that this is their philosophy) is to peak our own value and still get the deal done. The red dot is where “cliff negotiators” often end up because the deal doesn’t get done. This actually represents a cost (negative value) because that relationship has often been scorched and there is no “try again”. The problem with negotiating to maximize our own return is that we don’t know where the cliff is! This is represented by the red cloudy band. There is some probability that it lies in this range but we have no way to know where the breaking point actually is. Compounding this problem, we overestimate the amount of value that we think we bring to the table. We believe we are still in green territory until we find ourselves losing the deal entirely. Like a poker player losing a big hand, we go on tilt and are even more tempted to try this strategy with the next negotiation because we need to make up ground, only to find ourselves again falling short. Even if we believe we are “green dot” negotiators, we must be on guard about our own misperceptions. It’s critical that we develop a keen sense of awareness and understanding about how the other party sees the deal. Most of the time figuring a way to get the deal done and closed is far better than pushing forward to extract as much value as we can. We should always remember this is unlikely to be our last negotiation with the other party and we want to set ourselves up for the next time. We agree on the problem, and I have a solution, so how hard do I push to get my highest price? Thank you, Matthew, for your insightful guidelines. Wow, have I witnessed this! I’ve also been party to it. One of the most difficult hurdles is figuring out what the other party really wants. If everyone is being honest and conscious about their needs, then it can still be difficult. I think most people don’t even know what they want, or worse, what they want is to defeat the “other” at all costs.